1892, the year that Northwestern and Michigan first played each other, was a pivotal season for NU’s early football program. Coming into the fall, this was supposed to be the year that the Purple & Gold took its football team from a minor factor in the Midwest to a true power. That summer, Northwestern joined the new Western Intercollegiate Athletic League conference, both the major and minor divisions. The school’s new field (where the fraternity quads now stand) first saw play in 1891, and just before the ’92 season NU built a wonderful new grandstand that could seat over 1,000 fans. And the team had an influx of great talent, including future stars Alvin Culver and Jesse Van Doozer. However, the program had serious challenges as well, issues that threatened to end the sport in Evanston. NU had named Knowlton “Snake” Ames its very first head coach in 1891, ending the practice of having the students coach themselves. Ames was a famous Princeton star from the 1880s who was supposed to bring East Coast coaching prowess to NU. Ames initially provided coaching to the team during the 1891 preseason. However, he eventually began to travel to West Lafayette, also coaching Purdue. Ransom Kennicott, NU’s left halfback, served as the de facto Purple & Gold coach. As the 1892 season began, Ames split time between coaching Purdue again and playing for the Chicago Athletic Association, leaving Evanston in the lurch. The duty to lead NU’s team would have fallen to NU’s presumptive captain, Charles Kelley, but Kelley abruptly left Northwestern during the summer. The team picked Paul Noyes as its new captain and—by default—its trainer as well. Noyes had played for NU in 1888 and ’89 before transferring to Yale. While at Yale he had had been a sub on the football team and had trained under Walter Camp. Noyes returned to Evanston with acclaim in 1892, but the team, without its formal coach, was disheartened; many players stopped showing up for practices. Noyes implored students to turn up for the preseason practices, going so far as to threaten to leave the school and join the Chicago Athletic Association himself if more students didn’t make an effort. Even with the threat, NU stood dangerously close to failing to field a full eleven players for ’92. 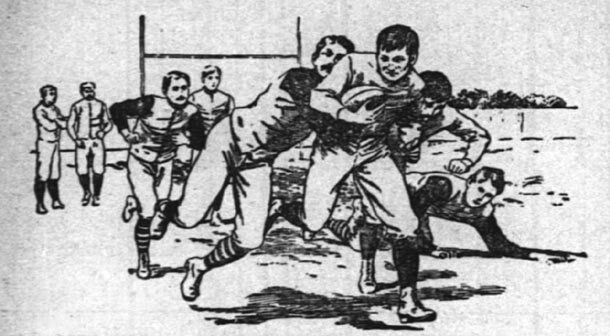 Despite the turmoil, 1892 began with an easy win against Lake View High School (considered a practice game). NU then beat the Chicago YMCA on Saturday, October 1, on NU’s new field. Later the following week, NU played another practice game, against the Chicago Athletic Association, losing 10 to 0 (a game that does not appear on NU’s official record). Among the players for the CAA was none other than NU’s formal coach at the time, Snake Ames. On Wednesday, October 12, NU faced Illinois for the first time ever. Surprisingly, despite Northwestern’s football history stretching back to 1876, Illinois was only the fifth college the Purple & Gold had ever played. Most of NU’s opponents up to that point had been athletic clubs, with prep schools as warm-ups. NU and the Illini fought to a 16-all tie. The following Saturday, NU hosted Beloit College and dedicated the new grandstands, christening the grounds as Sheppard Field in front of a capacity crowd. NU trounced Beloit 36-0, sending a message throughout the Midwest that Evanston might be better than had been expected. Noyes had rallied his team, and the following Saturday NU faced its biggest test to date with a boost of confidence. The team traveled to Chicago’s South Side Park as the visitors, facing Amos Alonzo Stagg’s new University of Chicago squad. Though Stagg and company were heavy favorites, NU held them to a (somewhat sloppy) scoreless tie, and—except for the practice match vs. the CAA-- remained undefeated for the season. The Wolverines were next up. Northwestern and Michigan had tried to schedule a meeting several times since 1879, Michigan’s first year of football, but each attempt had failed. Now, Michigan was the most powerful team in the Midwest, with a following that rivaled the East Coast established programs. Northwestern would host the first game, but decided not to use the new grandstand in Evanston—despite its large size, it was inadequate to hold the expected crowd from Michigan and the large number of Northwestern supporters expected for this showdown. Northwestern again traveled to Chicago’s south side on October 29, but this time as host, for a game at the old 25th Street grounds. The game was one of the most highly anticipated matches in the Midwest. While both NU and Michigan were doing well for the season, Michigan was a substantial favorite: NU’s players weighed an average of 150 pounds, while Michigan’s were 175 pounds, and expressed their confidence in victory the week leading up to the game. Michigan’s team arrived by rail the night before and stayed at the Tremont Hotel, one-time home to the old Chicago Football Club. Among the group from Ann Arbor was Frank Barbour, a recently-graduated Yale quarterback who had played alongside Noyes and had become Michigan’s second-ever head coach. Amazingly, he would not coach the game against NU the following day: he was to serve as the game’s umpire. The referee, at least, was neutral—Tom Craig was a graduate of Cornell. Michigan’s players included Frank Decke, the Wolverine’s starting left tackle; Paul Woodworth, left end; George Dygert, team captain and fullback; and George Jewett at halfback. Jewett, a native of Ann Arbour, was the first African American ever to play for Michigan (as well as for any school in the eventual Big Ten conference). Northwestern, in addition to Noyes, featured Alvin Culver at right tackle; John Oberne, left end; Ransom Kennicott, left halfback; and Robert Sheppard, fullback. The 25th Street Grounds were decked out for the game, with American flags fluttering atop the grandstands, along with purple and blue pennants. Just the day before, on Friday afternoon, Northwestern chose to change its official colors from purple and gold to just royal purple. Despite this, the north goal posts were draped with the old purple and gold streamers; the south posts sported blue ribbons. Well over 1,500 fans, the vast majority of which were NU supporters, piled into the grandstands. The group included a huge cheering section of female NU students, all wearing new purple ribbons. The sky was clear, with a mild breeze coming from the northwest. It was about 60 degrees at kickoff, a perfect afternoon for football. The referee and umpire conferred with the teams’ captains at 3:00 p.m., and agreed that two 30-minute halves were to be played, shorter than the usual 40 or 45-minute halves of the time. Northwestern won the toss. The opening kick went to Northwestern. Kennicott took the first possession out of the V formation for a 12-yard gain. After several plays NU advanced to midfield, but Sheppard fumbled. Decke, the left tackle for Michigan, recovered. At first, no one on the field, on either team, noticed that Decke had the ball. He raced untouched to the endzone for a touchdown, good for four points. The try after touchdown was no good. Jewett’s kick had sailed wide. Noyes opened the game by trying to find a weak spot. Despite the fumble and Michigan score, Noyes discovered that running up the middle was more beneficial than trying to run around the ends. This limited Kennicott’s play, since he typically ran off the end, but it provided a bruising march through the Wolverine middle by most of the NU backfield. NU’s next possession began exactly as the first: Kennicott, out of the V, rushing for 12 yards. Culver and Noyes each picked up 10 yards, and Michigan suffered an offside penalty. Within striking distance, Noyes plunged over the goal, giving Northwestern its first touchdown against the Wolverines. Fans at the game tried out Northwestern’s new yell for the first time: “Wahoo! Wahoo! N.U., N.U., Rah! Rah! Northwestern!” The yell was the first to replace “N.W.U.” with “N.U.,” and it was decidedly not a hit. Students soon reverted to using “N.W.U.” in their cheering yells. NU’s kick after touchdown also failed, and the score was knotted at four apiece. Michigan did a particularly good job of providing a wall of players to guard and block for its runners. Jewett marched 15 yards downfield on Michigan’s next possession. The Wolverines managed to break into NU territory, but were unable to score. NU also failed on its next possession, resulting in a Noyes punt. The two teams traded punts, with Sheppard fielding a high, floating punt by Michigan. Sheppard had the option of either re-punting immediately back to Michigan or returning the punt. For a split second, he hesitated, then began to sprint. Sheppard returned the ball back to Michigan’s line of scrimmage and passed the last Wolverine defender. Before he could score, however, he slipped and downed the ball near the Michigan goal. Several plays later, Culver burst across the line for NU’s second touchdown. As Noyes lined up for the try after touchdown, the crowd began a deafening cheer. Noyes’s kick was good (for two points, per 1890s rules), and Northwestern took a 10-4 lead into halftime. The second half saw the teams seesaw across the field. Michigan threatened to score early in the half, but fumbled, leading to a Northwestern return into Wolverine territory. Sheppard was a spectacle, gaining at will and tackling effectively. During the second half impasse, NU senior left guard Charles Wilson become a little too frustrated and took it out on the Wolverine left guard, Charles Thomas. Wilson was a 27-year old graduate student at Garrett, an ordained Methodist minister, and a hulk of a man. Reporters had taken to calling Wilson “the fighting parson,” which is one possible source of the myth that Northwestern had assumed the nickname “the Fighting Methodists” during this period. During the Michigan game, Wilson was rumored to have stood near the NU five-yard line while the Purple was on defense, raised his arms, and shouted to his teammates to “stop them in the name of the Lord!” Wilson ended up slugging Thomas, which earned the fighting parson an immediate ejection from the game. According to one reporter at the game, after his ejection, Wilson skulked on the sideline, during which “he talked as if he wanted to eat all the Ann Arbor crowd.” Wilson’s Methodist superiors soon decided that Wilson’s violence and unfortunate nickname weren’t good for the church’s image, and banned him from playing further games. Even with Wilson’s departure, the violence did not abate. Jewett, who had been playing wonderfully, got the ball for Michigan and raced toward the goal. The lone Purple player in his way succeeded in tackling him, but was followed after the play by about a half dozen additional NU players, who piled on. Jewett, his face bloody, rose from the crowd, and the fans—both NU and Michgan’s—became upset. Fans screamed at Jewett to name the player who had beaten him in the pile. Jewett screamed back, “no! He wouldn’t name me!” The crowd cheered when Jewett re-entered the game a few minutes later. Michigan eventually marched the ball back to NU’s goal before again giving it up. NU, however, could not manage any further progress against the Wolverine defense. Noyes, punting from his own one-yard line, had his kick blocked. The ball bounded back into the endzone, where it was recovered by Michigan for the potentially tying touchdown. Jewett, however, again missed the kick, and Northwestern clung to a 10-8 lead. The Purple went on to beat Chicago in a re-match and also beat Lake Forest, but lost games to Minnesota and Wisconsin. 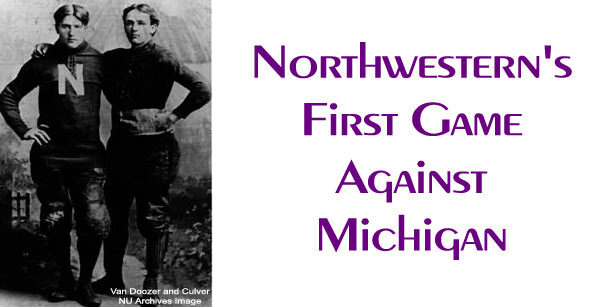 The wins against Michigan and Lake Forest, along with the tie vs. Illinois, were enough to earn Northwestern the 1892 minor division championship of the new League, NU’s first-ever football title of any kind. The win against Michigan would stand as NU’s greatest victory until the Purple’s 1896 triumph against undefeated Chicago. Before the start of the 1893 season, Michigan star George Jewett had a falling out with Michigan’s medical school. He transferred to Northwestern, becoming NU’s first-ever African American varsity football player. He played a critical role on the team in 1893 and ’94. Northwestern finally ended its disastrous agreement with Knowlton Ames, and formally installed Noyes as its head coach—NU’s first true, dedicated head coach—before the ’93 season. Sources include Tale of the Wildcats by Walter Paulison; The Northwestern, Oct. – Nov. 1892; Chicago Inter-Ocean, October 28 – 30, 1892; Chicago Tribune, October 30, 1892; Detroit Free Press, October 30, 1892.